Does your company have an Asset Management process? Perhaps you’re familiar with this annual routine for auditing your company’s assets: Print the asset list, and then go out with your clipboard checking off items as you find them. “Where is that new laptop we bought last year? I thought John was using it in the warehouse”. “No, he left 3 months ago. I think he turned it over to Jane in HR”. “Jane was out of the office that day and couldn’t collect it. Maybe he returned it to the IT Group”. And off you go on one wild goose chase after another. Asset Management is one of those fundamental processes necessary in just about every business in every industry. Businesses large and small all need to know what they have, who has it, and where it’s at. More equipment “walks out the door” than you might imagine. Equipment gets informally transferred from one employee to another, and then a replacement is ordered leading to more expense than is really necessary. Time is spent searching for lost or misplaced items causing frustration and lost productivity. The purchasing process becomes chaotic with “urgent” requests to buy lost or misplaced items that are needed immediately. Individuals are accountable for the equipment assigned to them. Summary reporting helps identify whether company assets are being deployed productively. Purchasing decisions can be made based on rational planning and real business needs. Infrequently used items can be located quickly when needed, reducing frustration and time lost searching for them. Asset Management at the small group level may involve a check out sheet such as a “key log” or “tool room list” which employees sign when receiving or returning an item. 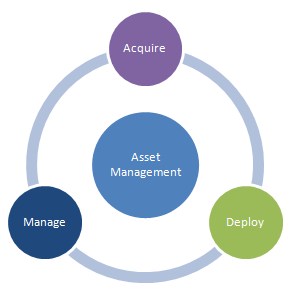 At the company level, an Asset Management process often involves computer based tools which can be as simple as a spreadsheet of items, or a more robust system which uses Asset Management Software to store the details in a database and manage the transfer of items from one employee or location to another. Asset Management processes may be handled by a small group or individual, or may span multiple departments depending on the needs of the organization. For example, processes involving functional managers are often developed for checking items out to new employees during the on-boarding process as well as checking them back in upon departure or transfer between job roles. Personnel from purchasing may also be involved in the initial creation of new asset records, and Senior Managers/Executives may have access to review reports to ensure the company’s assets are deployed productively. If your company doesn’t have a formal Asset Management process, you can get one started easily and begin realizing the benefits right away. Many asset management systems are web-based these days making them accessible from anywhere, without the need for complicated software and database server installation. With most systems available via a free trial, you can be up and running in minutes and bring some order to your asset management process right away. Eliminate the frustration and unnecessary expenses, and bring some order to your organization – implement or update your Asset Management processes today! If you don't already have a system in place, get started with our Online Asset Management Software. Sign up for free to try it out, and contact us with any questions you may have.